Disputes concerning the Person of Christ did not end with the sixth Council in AD 681, but continued through the eighth and ninth centuries. This time, the controversy focused on icons—pictures of Christ, the Theotokos, the saints, and holy events—and lasted for 120 years, starting in AD 726. Icons were kept and venerated in both churches and private homes. Iconoclasts also called “icon-smashers,” they were suspicious of any art depicting God or humans; they demanded the destruction of icons because they saw icons as idolatry. Iconodules also called “venerators of icons,” they defended the place of icons in the Church. 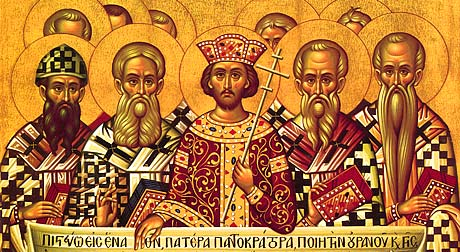 The iconoclasts had support from both inside and outside the Church. Outside the Church, there may have been influence from Jewish and Muslim ideas, and it is important to note that just prior to the iconoclast outbreak Muslim Caliph Yezid ordered the removal of all icons with his territory. Inside the Church there had always existed a “puritan” outlook which saw all images as latent idolatry. The Lord spoke this parable: “A sower went out to sow his seed; and as he sowed, some fell along the path, and was trodden under foot, and the birds of the air devoured it. And some fell on the rock; and as it grew up, it withered away, because it had no moisture. And some fell among thorns; and the thorns grew with it and choked it. And when His Disciples asked Him what this parable meant, Jesus said, “To you it has been given to know the secrets of the kingdom of God; but for others they are in parables, so that seeing they may not see, and hearing they may not understand. Now the parable is this: The seed is the word of God. The ones along the path are those who have heard; then the devil comes and takes away the word from their hearts that they may not believe and be saved. And as for what fell among the thorns, they are those who hear, but as they go on their way, they are choked by the cares and riches and pleasures of life, and their fruit does not mature. Blessed are Thou, O Lord, the God of our Fathers. For Thou art just in all that Thou hast done. Titus, my son, the saying is sure. I desire you to insist on these things, so that those who have believed in God may be careful to apply themselves to good deeds; these are excellent and profitable to men. But avoid stupid controversies, genealogies, dissension, and quarrels over the law, for they are unprofitable and futile. As for a man who is factious, after admonishing him once or twice, have nothing more to do with him, knowing that such a person is perverted and sinful; he is self-condemned. When I send Artemas or Tychicus to you, do your best to come to me at Nicopolis, for I have decided to spend the winter there. Do your best to speed Zenas the lawyer and Apollos on their way; see that they lack nothing. And let our people learn to apply themselves to good deeds, so as to help cases of urgent need, and not to be unfruitful. All who are with me send greetings to you. Greet those who love us in the faith. Grace be with you all. Amen.